The California Redwood Chorale was founded in Sonoma County in the winter of 2006 by soprano, Gerry Schultz. Singers were gathered from 7 Bay Area choirs to form a mixed voice chorale of 40 singers under the direction of Daniel Canosa. Daniel brought his high level of musicianship and talent to the CRC. This exciting group studied a varied repertoire for 6 months. In the summer of 2007, they traveled to Hungary, to the lovely Lake Balaton region. The Chorale gave 5 concerts in various lake-front towns. At each concert, they were joined by one or two Hungarian choirs from that area. In October of 2007, the California Redwood Chorale gave a fabulous concert in Santa Rosa, Ca. called “Home From Hungary”. The big crowd enjoyed the music and the visuals, rewarding the Chorale with a standing ovation. During the winter and spring of 2008, the Chorale prepared for their next adventure. They were accepted into the prestigious Canadian festival in British Columbia called the International Choral Kathaumixw. This huge event took place in July 2008. There were 1000 singers from around the world. Next, the CRC began to prepare their next project. The chorale prepared Kodaly’s exhilarating “Missa Brevis”, written in 1944. For this work, the group expanded to 44 singers. Concerts of this passionate music were given in Santa Rosa, California in October of 2009, and in Marin County, California on March 6, 2010. In the summer of 2010, the Chorale traveled to Hungary…a return journey…taking the Missa Brevis home to where it was born. The singers joined voices with the MONTEVERDI CHOIR OF BUDAPEST on Friday, June 25, 2010 in BUDAPEST, HUNGARY to sing Kodaly’s “Missa Brevis” under the direction of Daniel Canosa. The concert was held in the Mathias Church, Hungary’s most beloved church. On Wednesday, June 30, 2010, we gave a joint concert of the Kodaly mass in the cathedral of VESZPREM, HUNGARY with the VESZPREM CHOIR. In October 2010, the CRC began a new chapter. Robert Hazelrigg joined CRC as our new conductor. 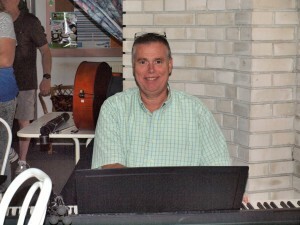 Robert brought vast musical talent and experience to our group. June of 2011 is when the California Redwood Chorale Sings Italian! concerts took place. This jubilant repertoire entertained our audiences. We featured Bonnie Brooks, mezzo and Paul Murray, baritone as well as the 4-piece Gravenstein Mandolin Ensemble. On Oct. 21 and 23 of 2011, CRC mixed American music in with Italian music for 2 wonderful concerts. CRC prepared for our big trip to Verona, Italy in April, where we entered the competition of a large international choral festival. On February 25 and 26, 2012, at the Glaser Center in Santa Rosa, Ca., CRC sang the World Premiere of “Unfinished Life” by Randall Keith Horton..a musical tribute to the late Kate Wolf. Bonnie Brooks was the featured soloist, and Michael Bolivar charmed us on his saxophone. This event was attended by over 500 of Kate’s family and fans. In January 2014, CRC traveled to beautiful San Juan, Puerto Rico for a week of singing and adventures. We gave four performances. Our joint concert at the state-of-the-art Conservatory of Music with Ars Vocalis was very special. This group is conducted by the well-known William Rivera. We also gave a joint concert later in the week with the Alumni Chorus of the University of Puerto Rico conducted by Juan Carlos Vega. During our week in lovely Puerto Rico, we had many wonderful and exciting adventures from hiking in the rain forest to kayaking the the dark in a bio-luminescent bay to a cooking class to an excursion to Bacardi Rum Factory! This was one of our best trips! In June of 2015, CRC spent 2 glorious weeks in Austria and Hungary. In Vienna, we were joined by the Monteverdi Chorus of Budapest. The two choirs performed John Rutter’s “Requiem” in Vienna’s largest cathedral…St. Stephens. After 4 days in Vienna, we took a boat down the Danube to beautiful Budapest. Once again, these two choirs joined to sing Rutter’s “Requiem” in the gorgeous Mathias Church overlooking the city and the Danube. The church was filled to capacity. Our second week in Hungary was spent at our beloved Lake Balaton. Here, we had reunions with local choirs we had performed with in past years. This was the most special trip CRC ever experienced. In 2016, in the fall, CRC celebrated our 10th Anniversary by giving 2 concerts and then traveling to Santa Fe, New Mexico to perform and enjoy the natural beauty of the region. June 2018 – off we went to Tuscany for the most delightful trip! Our 3 concerts were fantastic and the audiences were standing room only and very enthusiastic! Singing with the Italian choirs was a highlight. Gage Purdy joined CRC as our new director in November 2018. Please read all about Gage by clicking on our Archives. Thank you for supporting California Redwood Chorale! 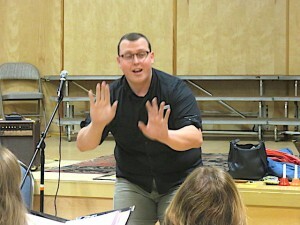 Music Director is Gage Purdy. Auditions for good singers who can read music and who have choral experience are always open. See us on Facebook by searching California Redwood Chorale.